Clive sat down in his favorite red leather wingback chair, and gestured to his wife to do the same. 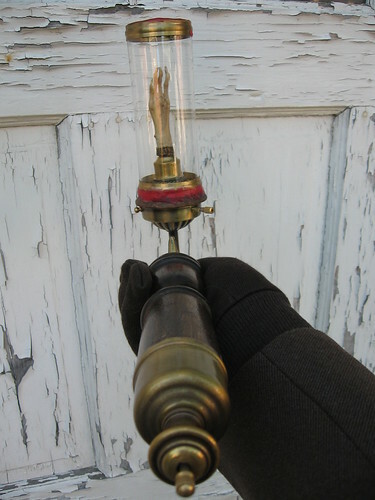 Taking his round, dingy brass goggles from his forehead and fidgeting with them in his lap, he began to tell her all about the device which he dramatically called “The Torch of Saint Dismas”. 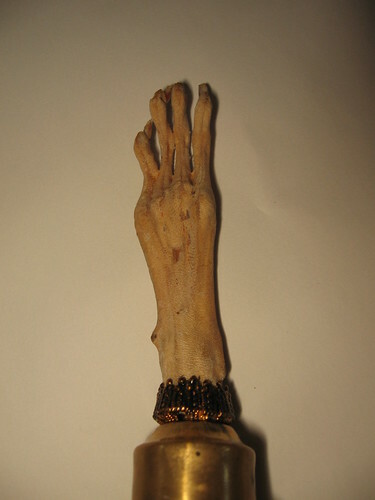 It was identical in purpose to the legendary “Hand of Glory” or “Thief’s Light” in that it cast a light visible only to the one holding it. 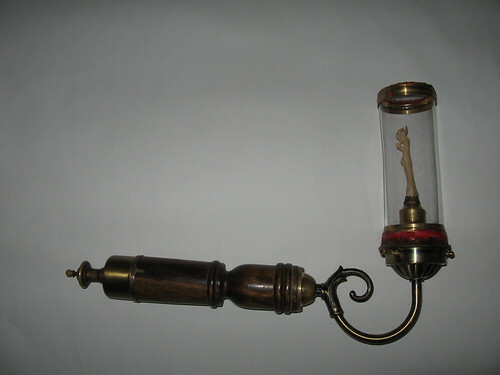 As Emily knew, such a device was typically made from a human hand–which, availability aside, she always felt was a “bit much.” Clive informed her that through a bit of research and experimentation, he found that, if treated and preserved in the same manner, a common rabbit’s paw could serve just as well. She looked slightly sick when he told her this, but was comforted to hear that Old Man Reiber would have made dinner out of the poor creature regardless of what her husband had planned for the left-overs. “So the bunny wasn’t hanged for murder, then?” she asked with mock seriousness. “Nope,” he replied with a sideways smile “the next best thing: shot by a babbling hermit in a graveyard with a full moon shining overhead”. The dashing young man went on to educate her on all the other features of the device. 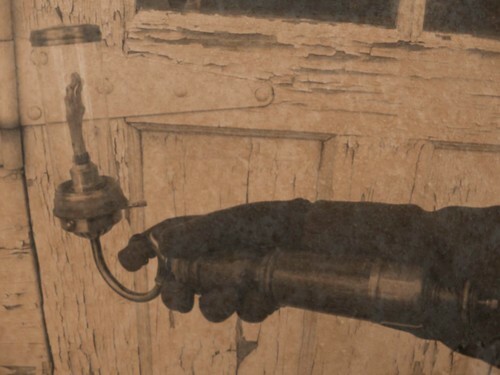 Among other things, he had discovered that the “hand” need not actually be set ablaze to cast its personalized glow as its traditional counterpart had, but could instead simply be exposed to a rather ordinary mix of chemical gases. 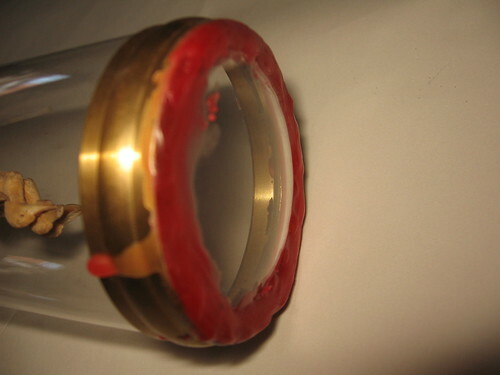 These gases were pressurized in copper chambers in the device’s wooden handle, while their admittance into the glass chamber were regulated by the small brass knob on the opposite end. Taking his creation back into his scarred hands, Clive demonstrated this action as well as the way it could be held in two different positions. Emily playfully grabbed the torch back and aimed it so as to cast it’s harshest beam directly into her beloved husband’s eyes. 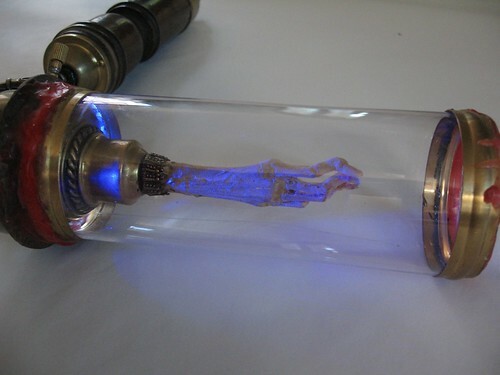 He smiled confidently as her delicate fingers twisted the valve, causing a just barely audible hiss of invisible reagents to release into the sealed jar. She smiled grandly as she saw that while Clive’s face was bathed in a brilliant bluish light, his pupils remained as they were–for to him, not a hint of illumination was present. “I told you I was a genius”, he said cockily, still staring at the non-light. “You certainly are bright!” she replied sweetly, as she grabbed his relaxed hand and touched it to the torch’s handle with all the speed of a bolt of lightning. 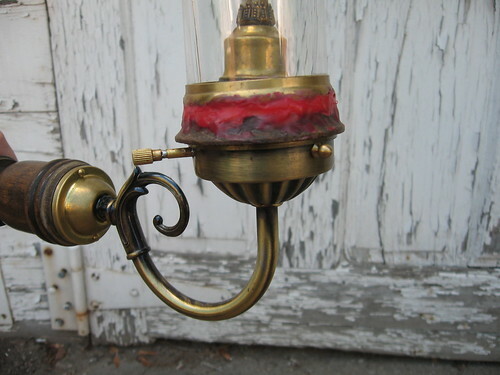 “Vondruke!” he cursed as he quickly let go of the lamp and massaged his now burning eyes. “Why are you so cruel to me, Emily?” he asked with greatly over-the-top faux-pain. To this she replied by sticking forth her tongue. 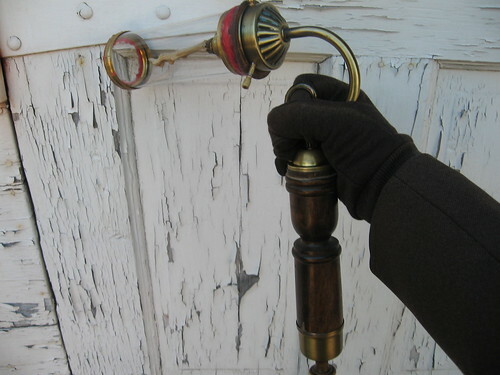 When their laughter had subsided, Clive stood and handed Emily a familiar black leather physician’s bag containing a black hooded cloak, gloves, and an elegant belt from which the rest of her trusted thieving tools were suspended. The making of this contraption begins with a rather odd tale; one that may very well sound as though it belonged in the fictional portion of the article!It all started one rainy evening (no joke), when I descended into our cluttered basement on a mission to locate something for my parents.As a young lad I had a small trampoline (of the sort one uses for aerobic exercise), which my autistic nephew’s therapists thought would provide him with some therapeutic activity.We had located the actual trampoline a while ago, but the legs which held it off the ground were yet to be found—and thus the reason for my poorly-lit search.On a whim, I began to excavate the space under my mother’s unused sewing table.Among the 5 ½” floppies and other relics of my childhood which had been crammed in there over the years, lay a short length of heavy steel pipe.One leg down, five to go!Now heartily convinced that I was indeed looking in the right area, I dug with increased fervor. A few moments and two more legs later, the “mine” was deep enough that I could no longer see into it, but instead blindly scooped out piles of stuff and sorted through them in the open.Square in the middle of the second such pile lay an organic-shaped, off-white object.For a split second, I thought it was a figure from an old Nativity set which was made of a similarly-colored plastic.As I looked closer, however, I saw that it had a much more skeletal look to it.A piece from the small toy human skeleton my brother had given me as a boy, perhaps?Unfortunately, no.A sharp pang of panic and revulsion hit me as it became all too clear that the thing before me was not made of plastic, nor any man-made substance—this was part of an animal.Shaking slightly (I’m so brave), I scooped the grisly thing onto a bit of cardboard for closer inspection (See? Brave! ).What ever sort of flesh it had bared in life had long-since dried up and tightened against the bone—giving it an appearance somewhere between that of a human mummy’s hand and a bird’s foot.There was no hair of any sort to be seen, and it looked to have been fairly cleanly severed at the “wrist”.On the end of each finger/toe were rather remnants of rather evil-looking claws—arching downward like the talon of some prehistoric predator.By the Cogs, was it horrid!It was quite clearly the foot (irony fully appreciated, I assure you) of some sort of small beast, but what?And, more importantly, what was it doing in my basement?!? !Having had pet cats for the vast majority of my life, I was familiar enough with feline anatomy to see that it could very well be the somehow-preserved remains of a cat’s paw.That answered the “what”, but it certainly left the “how” wide open.We’ve had many cats and a few wild animals find their way into our abode over the years, it’s true, but I was quite certain none of them had lost a limb!Though this thought had a calming effect for a brief moment, it soon led to the troubling realization that perhaps it was I who had severed the limb; that perhaps the rest of the being was still under the table. At this point, I thought it wise to give my own mental and sensory capacities a break and show my disturbing find to my father, who was working on his own project in the next room.After I had thoroughly convinced him that it was not the practical joke he understandably though it to be, he shuddered, shrugged, and suggested I show it to my mom.Ah yes, Mother!Surely she, trained in the veterinary and x-ray sciences, would know what it was!Unfortunately, she too was stumped (and, I suspect, made slightly queasy).We discussed the feline possibility briefly, but she agreed that this was unlikely—then again, in what universe is it likely to find the foot of any species of animal in one’s house?Then, perhaps inspired by the cat theory, my dear mum was hit with a rather brilliant thought: a rabbit’s foot!I did recall owning one in keychain form as a child, but I had always been sure that it was no more organic than a teddy bear.Besides, where was the fur?The key-ring hardware?Surely any decomposing agents capable of wholly destroying metal and hair would not leave flesh and bone completely untouched!Still, it did provide a reasonably sane explanation for several of its mysteries; not the least of which being how something could become naturally mummified in an environment which would seem to be about as conducive to such things as a rain forest.Regardless, a quick Googling of “rabbit skeleton” resulted in an image that positively identified the thing as the hind foot of nothing more exotic than a common bunny.I will admit to being a bit disappointed at this news though, as I did have the word “chupacabras” sitting hopefully on the back edge of my mind…Anyhow, the majority of the questions had now been answered and those that remained were relegated to the mental bin of mundane mysteries that could likely be easily explained by someone more familiar with the ways of the world, or simply a better memory than myself.The big question now, was what to do with this wonderfully creepy artifact? 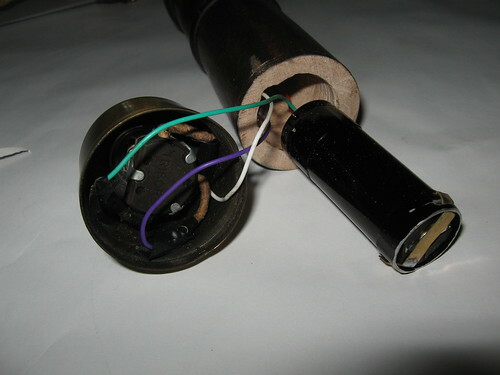 Anyway, on to the technicals.Concealed within the wooden base are six LEDs: two white, two blue, and two infrared.The white and blue pairs are wired together in parallel so that they are always on at the same time, with the blue ones aimed at the front and back of the paw and the white aimed straight up (to act like a conventional flashlight).The IR pair is aimed somewhere in the middle, with only a small amount hitting the paw.This pair of LEDs (harvested from TV remotes) really aren’t bright enough to serve any practical purpose, but I couldn’t very well call something a Hand of Glory unless it emitted some sort of invisible light, now could I?I should say, for those unfamiliar, that in this case “infrared” refers to a “color” of light which, while totally invisible to the human eye, is perfectly visible when viewed through a digital/video camera or night-vision goggles. Anyhow, the small knob on the back is a six-position rotary switch (from a “3-way” lamp).Turning it one click turns on the blue and white lights, two turns them off, three turns on all six LEDs, four turns them off, five turns on only the IRs, and six turns it all off again.Also spliced into the circuit is the “flicker chip” from an electronic tea light, which makes all the LEDs, well, flicker. 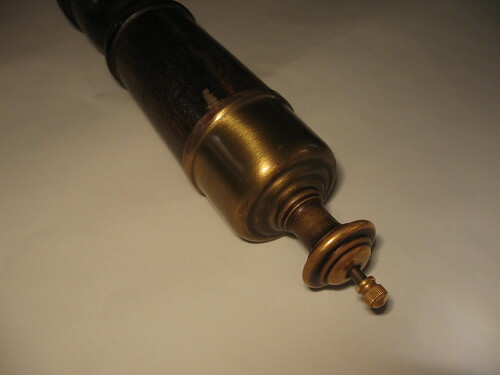 The whole thing runs off three “AAA” cells which sit within the battery compartment from a dollar-store flashlight stuffed inside the pepper mill handle. 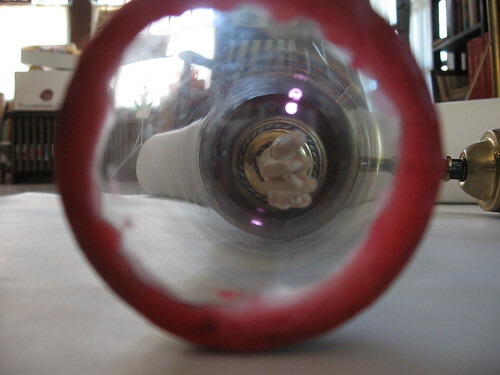 The glass “chamber” is all held together with my good friend, JB Kwik—with red candle wax dripped on for looks. Curse you Hildebrandt! Was that you crashing about in my lab last night!? Perhaps next you should invent shoes that only the wearer can hear! Ha! Anyway . . harumph . . a somewhat impressive effort. A wonderful device for sure, and likely far less conspicuous than a human hand. That’s awesome! Congrats on another great device. Excellent story and “story”, as well. It’d be great to somehow get an IR photo. Do you have a camcorder with a night-vision setting? Or maybe one of those cheap night-vision X-10 cameras? I *love* the story telling. I love your site and the works displayed within — as well as the imagination, humor and intelligence. One thing: Is there a photograph of the Victorian curio wall to be seen? Thanks everybody–you are all far too kind! As to the curio wall, I’m afraid there is next-to-nothing to it as of yet. Once I get it all set up, however, I will certainly share pictures! Love the story, but Dismas is the patron saint of thieves not Dismus. (http://en.wikipedia.org/wiki/Saint_Dismas). Also rabbits (and humans) are hanged, not hung. Very cool site, I was brought here from a link about your 25 USD HUD and have been browsing around since. A truly entertaining story as well as visuals. 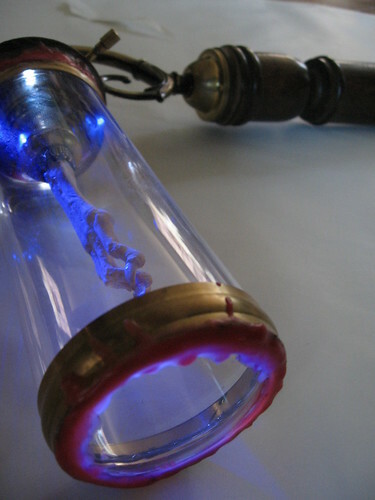 The lantern is a most impressive crafted curio. I can easily see in 80 years time someone stumbling upon it in an antique store. With a gasp of amazement they will stare. Thinking is it real? What is it? With no tale to tell only the lamp and foot will speak in their bizarre unison. Perhaps then your tale may well become reality in the minds of future generations. I want this a lot, now. And the only frightening thing about this is that I’m quite certain I have a rabbit foot somewhere that I picked up a couple of years ago – on the way home from somewhere, in a park. I knew I kept it for a reason, and not only because I thought it was lucky! well, dim, but clever. If that makes any sense at all. 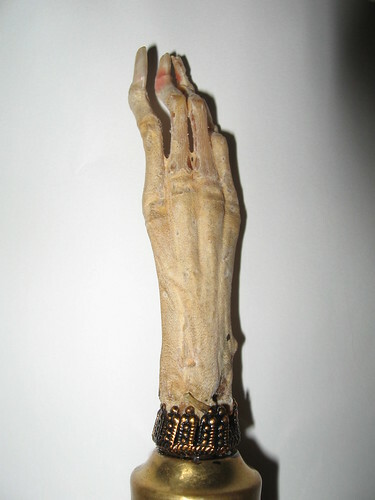 Please let me know the verse in the bible that talks about saint Dismus the hand of glory.